After two intensive days of exploration and documentation, the Hawai‘i Volcanoes National Park BioBlitz and Biodiversity & Cultural Festival held on May 15 and 16, 2015, captured a vivid snapshot of the unique plant and animal biodiversity in park. The event brought together more than 170 leading scientists and traditional Hawaiian cultural practitioners, more than 850 students and thousands from the general public. Together they conducted a comprehensive inventory of the plants, insects, mammals, birds and other species that inhabit the 333,086-acre island park. Under the theme of I ka nānā no a ‘ike (“By observing, one learns), alakai‘i were integrated into the survey teams for a more holistic approach to the research and exploration endeavor. More than 6,000 people, including more than 850 schoolchildren, participated in the BioBlitz and the concurrent Biodiversity & Cultural Festival. With a scientist-to-student ratio of 1 to 5, students were able to truly work side-by-side with top scientists. 22 new species (including jumping spiders) were added to the park’s species list, and sightings of 73 species at risk, including the Kamehameha butterfly and the federally endangered nēnē, were documented. The BioBlitz survey more than doubled the number of fungi species on the park’s list with 17 new fungi documented at the close of the event. Many more will be added in coming days and weeks. The initial scientific species count as of the afternoon BioBlitz closing ceremony on Saturday, May 16, was 416, with 1,535 observations recorded over the course of the two-day event. Organizers expect this number to increase significantly over the next several months as cutting-edge testing of the collected samples continues. The 35th annual Cultural Festival was moved from July to this weekend and expanded to include biodiversity booths and activities. The festival showcased how Hawaiians are true ecological experts and I ka nānā no a ‘ike principles continue today. The Biodiversity & Cultural Festival included hands-on science and cultural exhibits, food, art and top Hawaiian music and dance performances. The Hawai‘i Volcanoes National Park BioBlitz is part scientific endeavor, part outdoor classroom excursion and part celebration of biodiversity and culture. Participants combed the park, observing and recording as many plant and animal species as possible in 24 hours. Activities included catching insects, spotting birds, observing plants and fungi, and using technology to better understand the diverse ecosystems across the park. “The BioBlitz and Biodiversity & Cultural Festival presented an incredible opportunity to connect the community with leading scientists, international sister parks, and cultural practitioners this weekend,” said park Superintendent Cindy Orlando. “This event embodies our National Park Service centennial mission to encourage everyone to Find Your Park — literally — by exploring and understanding our vital connection to our natural world,” she said. The Hawai‘i Volcanoes National Parks BioBlitz was the ninth in a series of 10 annual BioBlitzes hosted by the National Geographic Society and the National Park Service leading up to the National Park Service centennial in 2016. During closing ceremonies, the BioBlitz flag was passed to Karen Cucurullo, Acting Superintendent for the National Mall and Memorial Parks, and Dr. Michael Stebbins, Assistant Director for Biotechnology in the Science Division of the White House Office of Science & Technology Policy. The 2016 National Capital Parks BioBlitz, will feature inventory activities at national park sites in and around Washington, D.C., May 20-21, 2016. The capital celebration will the cornerstone of BioBlitzes and biodiversity events at U.S. national parks that same weekend. Karen Cucurullo, Acting Superintendent for the National Mall and Memorial Parks, accepts the BioBlitz flag at the podium. The first BioBlitz was held at Rock Creek Park in Washington, D.C., in 2007. The second took place at Santa Monica Mountains National Recreation Area in California in 2008. Indiana Dunes National Lakeshore was the site of the third BioBlitz in 2009; Biscayne National Park outside Miami was the 2010 site; Saguaro National Park in Tucson hosted the 2011 BioBlitz; Rocky Mountain National Park in Colorado was the 2012 host park; in 2013 BioBlitz took place at Jean Lafitte National Historical Park and Preserve outside New Orleans; and Golden Gate National Parks in Northern California hosted BioBlitz 2014. Emcee Mileka Lincoln poses with the Youth Ambassadors. Park Ranger Julia Espaniola, far left, was named the BioBlitz Youth Ambassador representing Hawai‘i Volcanoes. NPS Photo. 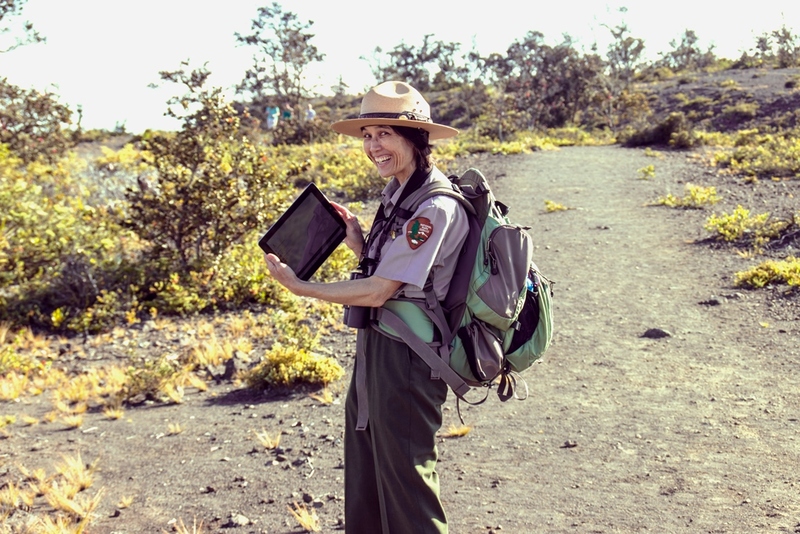 Verizon is the lead sponsor of the 2015 Hawai‘i Volcanoes National Park BioBlitz. Generous individual, organization and foundation support has been provided by Mr. and Mrs. Thomas D. Rutherfoord Jr., Friends of Hawai‘i Volcanoes National Park and Hawai‘i Pacific Parks Association, Harold M. and Adeline S. Morrison Family Foundation, Harold K.L. Castle Foundation, Edmund C. Olson Trust II, and the Office of Hawaiian Affairs. Additional generous corporate supporters include Kona Brewing Company, KapohoKine Adventures, First Hawaiian Bank, Roberts Hawai‘i, Alaska Airlines and Big Island Candies. In-kind donations have been received from Hawai‘i Volcanoes Lodge Company LLC, KTA Super Stores, Hawai‘i Forest & Trail, Impact Photographics and Aloha Crater Lodge. Technology meets nature! Dr. Darcy Hu, Coordinator & Science Advisor for the Hawai’i-Pacific Islands Islands Cooperative Ecosystem Studies Unit, (CESU), at Kīlauea Overlook. Photo courtesy of Marvin A. Watts. National Geographic is a global nonprofit membership organization driven by a passionate belief in the power of science, exploration and storytelling to change the world. Each year, we fund hundreds of research, conservation and education programs around the globe. Every month, we reach more than 700 million people through our media platforms, products and events. Our work to inspire, illuminate and teach through scientific expeditions, award-winning journalism and education initiatives is supported through donations, purchases and memberships. For more information, visit www.nationalgeographic.com and find us on Facebook, Twitter, Instagram, Google+, YouTube, LinkedIn and Pinterest. More than 20,000 National Park Service employees care for America’s 407 national parks and work with communities across the nation to help preserve local history and create close-to-home recreational opportunities. Visit us at www.nps.gov, on Facebook, Twitter and YouTube.